Relating to the process of developing or producing a nest: The nidificant persistence of the two birds in finding the right materials and the assembling of their breeding place was observed and photographed by Monroe from the window of his workroom. The nidificant habit of the sparrows seem to be to return to the previous year's habitation and repair it in time for the new breeding season. 1. That which emits a scent. 2. Something that gives a characteristic smell to a product. 1. Meeting, kissing, and clinging to another person. 2. A reference to a close embrace or long kiss. 3. Adhering closely; embracing; applied to certain creeping animals; such as, caterpillars. 4. Intermediate in character, or on the border, between two genera, groups, families, etc, of animals or plants, and partaking somewhat of the characters of each, thus forming a connecting link. 1. Someone who participates, shares, or takes part in something. 2. Anyone who is sharing in or taking part in an activity, organization, group, etc. 1. 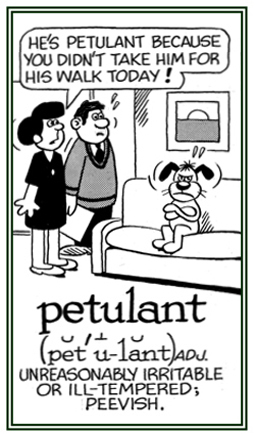 A reference to being annoyed and behaving in an unreasonable way as when someone cannot get what he or she wants; being irritable and impatient: When Jan doesn't get her way at home, she usually gets very petulant with her parents. 2. 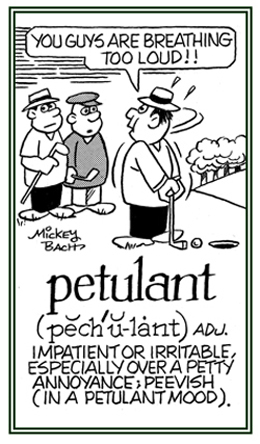 Characteristic of being contemptuous in speech or behavior; that is, feeling, expressing, or demonstrating a strong dislike or utter lack of respect for someone or something: When the politician is criticized for not achieving more for his voters, he often responds in a petulant or snappish way. © ALL rights are reserved. Any substance; such as, certain chemicals or waste products, that makes the air, soil, water, or other natural resources harmful or unsuitable to use: "More people are becoming more aware of how pollutants are harming their lives." 1. A substance which causes a separation of chemicals in a solution: The students in the laboratory tried several precipitants in an effort to complete their assignment. 2. A reason or cause of a certain event or action: Jane thought that stress was the precipitant of the development of cancer in her breast. Showing page 8 out of 11 pages of 164 main-word entries or main-word-entry groups.